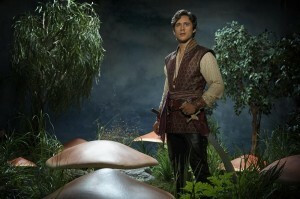 Once Upon A Time In Wonderland: New Cast Photos! The new Once Upon A Time spin-off set in Wonderland premieres October 10 on ABC, and to promote the series premiere, the network has released some new photos of the show’s very attractive cast. Within the new cast photos you can find Sophie Lowe (Alice), Michael Socha (The Knave of Hearts), Peter Gadiot (Cyrus the genie), Emma Rigby (The Red Queen), and Naveen Andrews (Jafar). We’ve done a number of interviews with the producers and cast of Once Upon A Time In Wonderland which you can find here. You’re also all invited to drop by our Once Upon A Time In Wonderland forum. But for now… enjoy the pics!